Bird hunting in Michigan is one of the state’s top pastimes. Pheasants, quails, and turkeys are the three most popular game birds. If you are thinking of trying your hand at hunting turkeys, you might need some expert advice to make sure you are as successful as possible. Here are our top three tips to make sure that your next Michigan bird hunting trip gets the results you have been hoping for. Any hunter knows that scouting forms a major part of the hunt. It allows you to find out more about the animals before hunting them. However, incorporating calls into your scouting is never a good idea. Calling works because turkeys associate it with other turkeys. If they begin to associate it with other things, it stops being effective. Instead, look for tracks, check areas that they are known to roost in, and look out for birds that are going to their roosts. 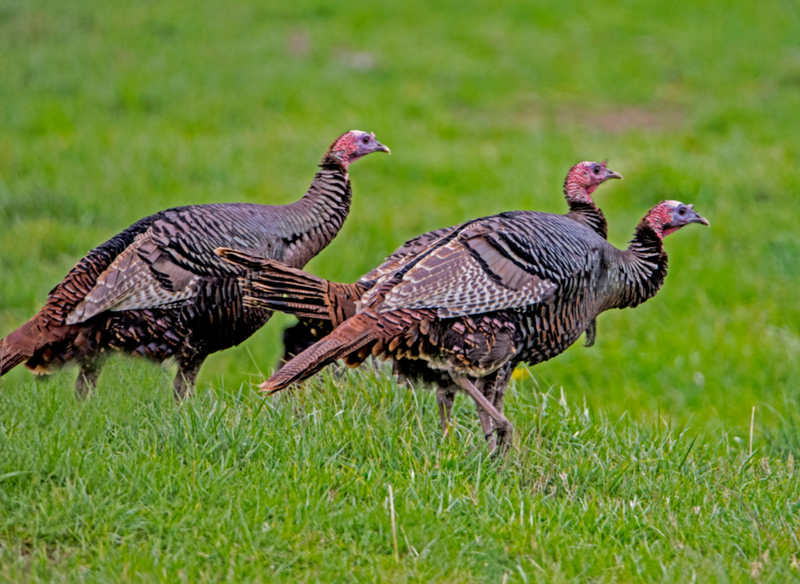 If you are a novice to turkey hunting, you might be put off if the birds go quietly. That’s a mistake. If you call at the birds and then get up too quickly once they quietly move closer, you could well end up busting your hunt. Give the bird enough time so that it can think. Remember that they are programmed to breed. As long as you are using the right decoy set up, you have a good chance. So, don’t quit too soon. Call every couple of minutes for as long as it takes until the bird calls back. Just because a bird goes quiet doesn’t mean that it is not coming in. A rookie mistake made by too many novice hunters is to forget that stillness is the key to success. If a turkey is closing in, you have to hold the right shooting position. Don’t make any moves other than pulling your trigger. Positioning yourself correctly should always be done before the turkey comes into firing range and slow movements are key. Remember that birds can see really well. That means they’ll detect even small movements. If a turkey is in your firing range and you move your gun, it will become aware that you are there. That means your chances of harvesting it are very slim. If you’re tempted to scratch your nose or change position, the best advice is not to. Ensure that the gun is held in the right position to take your shot and keep it there until it’s time to fire. If you lift up the gun to take your shot once the turkey is in position, you’re sure to be seen. If you’re hunting turkeys for the first time, these top three tips should help you to make your first hunt in Michigan a success. Bird hunting can be a steep learning curve and mistakes are inevitable. However, these pointers should help you to avoid the most basic errors. Here at Pine Hill Sportsman’s Club, we are one of the top pheasant farms in Michigan. We offer outstanding opportunities for upland bird hunting with a range of impressive hunting packages to suit all needs. Whether you are a skilled hunter or a complete beginner, we can meet your requirements, and we have packages available for both individuals and groups. We’ve been in the business for more than four decades. And, with our 600 acres of hunting grounds and full-service clubhouse, we offer the ultimate bird hunting experience in Michigan.